Prague is steeped in history, having stood for over 1100 years, even able to boast being the former seat of the Holy Roman Empire. 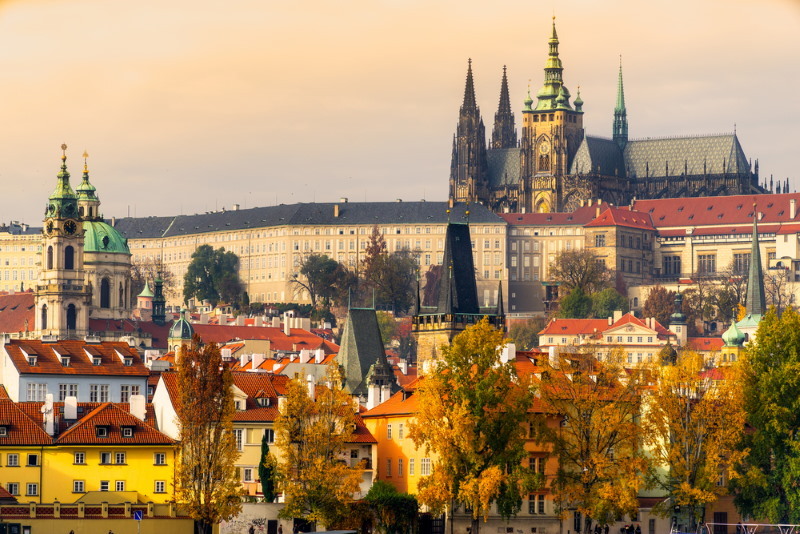 Now best known as the capital of the Czech Republic, Prague is a very popular tourist destination. The city escaped heavy bombardment during the Second World War and as a result still has many superb examples of architecture dating back through the centuries. Wenceslas Square is not really a square at all. It is more of a wide, spacious avenue some 60 metres wide by 750 metres long. It was originally included in plans drawn up by the Bohemian King Charles IV as a site to hold a regular horse market. These plans, for Prague’s ‘New Town’ date back to 1348. From that time, until the 1800s the area was called ‘the horse market’. 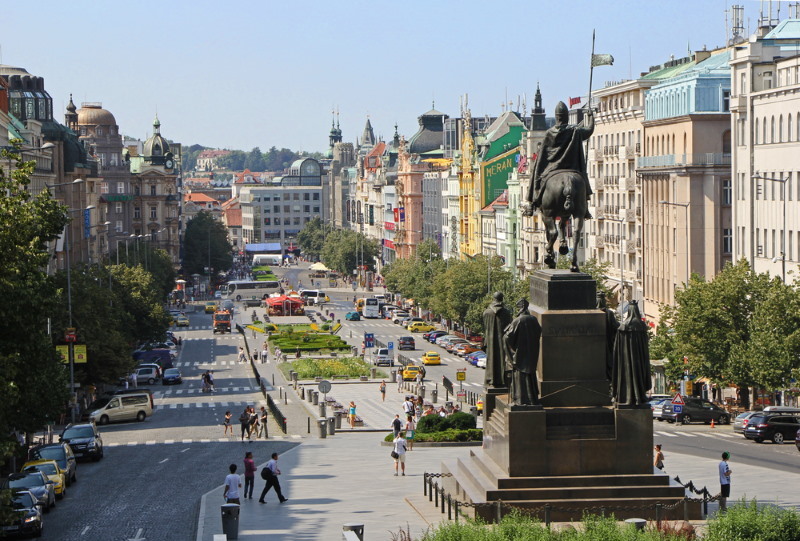 When the statue of King Wenceslas was raised, it was felt that the square deserved a more gracious name and Wenceslas Square came into being. Today the area, along with the nearby ‘Old Town Square’, forms the vibrant heart of Prague, boasting an abundance of hotels and accommodations, restaurants, bars and nightclubs, not to mention a host of shopping opportunities, both local and international. Just behind the statue of the famous, kindly king of the song is the National Museum whose grand building adds an air of stately magnificence to the square. A magnificent monument to elegance, architecture and beauty, the National Theatre of Prague is beautiful on the outside. The sturdy, yet attractive building was funded by the people of Czech nation who donated money towards the building of a national theatre of which they could all be proud. As lovely as the National Theatre is on the outside, the inside simply takes your breath away. Soaring almost six stories high, the gently curved roof is exquisitely painted and rendered with detailed paintings and gold leaf, and this attention to detail is obvious throughout the entire building. 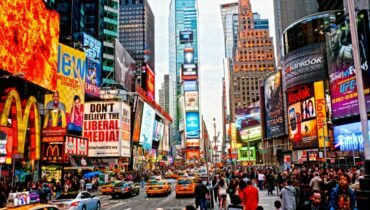 It is easy to imagine a nervous actor feeling dwarfed and swamped by the glorious surroundings, or perhaps the beauty of the building and magnificence of the stage encourages them to perform to the best of their abilities? 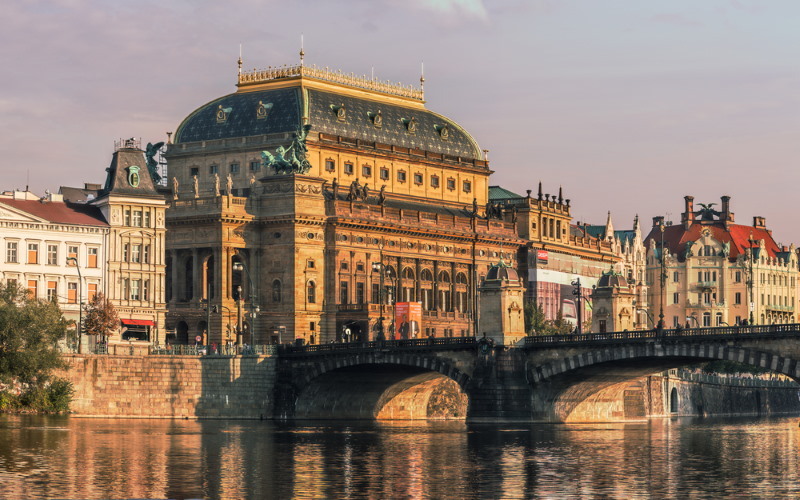 Whether you go to hear an opera (the National Theatre is the heart of Prague’s opera world), see a play or watch a sublime ballet, you are sure to be equally enthralled by the surroundings as the performance! Housed jointly in two buildings the National Museum of Prague, sited perfectly at the end of Wenceslas Square, is currently undergoing some renovation work, until June 2015. The most magnificent of the museum buildings (known somewhat unimaginatively as the Main Building) is, sadly, the one that is currently closed to the public, but this does not mean that you should avoid the museum altogether. The second, younger building may not be as imposing or grand as the original, but still holds interest of its own, quite apart from housing the exhibits. The New Building, as it is called, served as the parliamentary buildings for the Czechoslovakian communist government, and then was the home to Radio Free Europe. The museum authorities are determined that the museum will not disappoint, and has arranged a comprehensive series of exhibitions to keep the New Building fresh and full of interest until the Main Building is back in action. From first sight to final exploration, the Zizkov Television Tower is sure to excite, intrigue and entertain you. The tower stands tall over Prague, like a beautiful and stylised rocket ship speaking of modern technology and elegant design. The three graceful columns soar high over the city, with the tallest, the ‘rocket’ stretching up some 216 metres to allow for ease of transmission of broadcast signals. Nine pods cling to the columns, three of which are used for the serious business of the tower, while the other six are open to the public, offering breath-taking views over the entire city from 8am to midnight. As with many modern innovations there was opposition and grumbling about the tower when it was first conceived and appeared, ‘ruining’ the classical flow of the Prague skyline. Of late, the people of Prague have begun to take a grudging pride in their tower, not least because of the authorities’ firm campaign of promoting the positives of the tower; innovative, modernity and technical excellence all represented in one tall and graceful edifice. Be sure to keep your eyes peeled for the ten miminka or babies, sculptures created by David Cerny as a temporary exhibit in 2000 that then become so popular that they were returned to the tower in 2001, where they now crawl contentedly over the exterior of the tower. 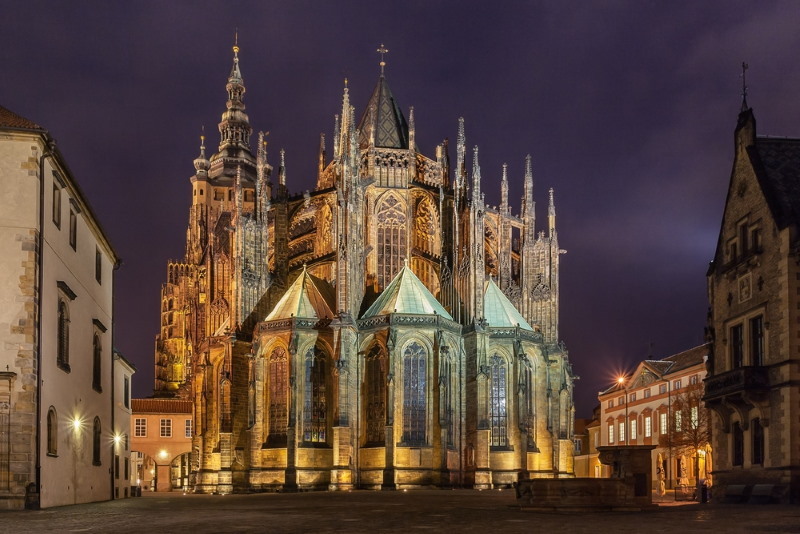 Situated entirely within the confines of Prague Castle, St Vitus Cathedral (or to use the full name, St Vitus, St Wenceslas and St Adalbert Cathedral) is the largest and most significant church in the entire Czech Republic. Construction began in 1344, under the rule of Charles IV, but took a staggering 6 centuries to complete, with the finishing touches being added in 1929. (Building work was not constant during this time; there were long periods when the construction stopped due to lack of funding.) The cathedral dominates the skyline, standing proud of the city and is an excellent example of a Gothic cathedral. The architecture of the cathedral is fascinating as it clearly shows the influence of foreign building styles and the use of unique innovations, such as the delicate and lovely net vaulting. The cathedral is currently in use as a religious building, with services and confession held regularly. Please do be respectful of this, if you happen to be visiting while a service is on-going. Prague Castle, former home to Bohemian kings, Roman Emperors and Czechoslovakian rulers, as well as being the official place of business for the Czech Republic’s leaders, is in the Guinness Book of Records as being the world’s largest ancient castle. The castle first saw life as a religious building in the year 870, growing and expanding along with the city over the years. The castle now is more of a great walled complex featuring the cathedral, various chapels, stables, palaces and several fortified buildings. There is even a medieval street contained within the confines of the palace grounds, Golden Lane, which is well worth a visit. Visitors can freely wander through the courtyards, but tickets must be purchased to go into the buildings. It is advisable to join a tour group so that you do not miss any of the important features and buildings. The Prague Orloj is the world’s oldest functioning astronomical clock and a visit to Prague cannot be considered complete without visiting it. The clock itself is the oldest part of the apparatus and dates back over 600 years to 1410. As with any ancient artefact there are numerous legends and stories about the Orloj, one of the most famous of which says that the authorities blinded the maker of the clock after he had completed it, so as to prevent him ever being able to repeat or outdo this masterpiece. In revenge, the clock maker asked his apprentice to take him to the clock, where he damaged it so that it could not be repaired. However, the clock has broken down and been repaired many times over the centuries, with moving characters, including Death represented by a skeleton, being fitted in the 17th century and models of the apostles being added in 1866. The Orloj is more than just a clock, featuring astrological predictions as to the time of sunset, the movements of the sun and moon, the motions of the Zodiac throughout the year and even a representation of ancient Czech time. Arrive early to witness the working of the Orloj, which happens every hour, on the hour, as a crowd can form up to 15 minutes beforehand. The Mala Strana is an entire area of Prague, known as ‘the Lesser Town of Prague’. Almost a separate village in its own right, the Mala Strana is centred around Lesser Town Square, and boasts an abundance of fabulous old churches, exquisite small shops and buildings and authentic, old fashioned cobbled roads. It huddles under the protective eye of Prague Castle and offers a wonderful glimpse into the world of Baroque architecture which dominates the area thanks to a series of destructive fires in 1541 that saw much of Mala Strana being rebuilt in the Baroque style. Mala Strana is the one of the oldest parts of Prague and was the chosen site for many noble homes, while the more bourgeois citizens preferred to live on the other side of the river. The Charles Bridge, which has been in existence since 1347 (although only named the Charles Bridge since 1870) connects the Old Town of Prague to the Castle, crossing the Vltava River. The bridge was a tremendous boon to trade and politics in ancient Prague, offering a sturdy and reliable crossing place. The bridge is 621 metres long and rests upon 16 arches – an incredible engineering feat for those times. In order to protect the bridge from attack by hostile forces, the bridge is protected by two towers on the Castle (or Mala Strana) side, and by one on the Old Town side. The single tower on the Old Town side is an astonishing and beautiful structure, covered as it is with wonderful carvings and statues, now sadly, almost all replicas. Stroll over the bridge, lingering to look down into the timeless water or examine the wares of the vendors who ply their trade on the broad sweep of the bridge. Splendid open spaces, fairy-tale building and ancient cobbled roadways underfoot are the instant hallmarks of Prague’s Old Town. Originally the main marketplace for the town, the Old Town Square is wonderfully central; a mere five minutes from Wenceslas Square and containing the astrological clock or Orloj, and easy access to the Mala Strana via the Charles Bridge. Stepping out into Old Town is like stepping back through the centuries, finding buildings and streets that survived bombardment, political upheaval and civil unrest unscathed; like a clear window into the rich and exciting history of the city. Prague is a city full of surprises, ranging from cutting edge technological advances to ancient architecture and a rich and fascinating history. 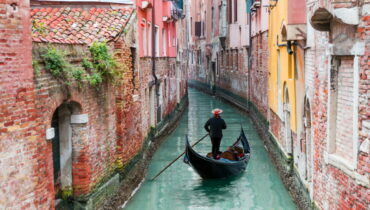 Come to this wonderful city and open your mind to her and she will open your heart too!